Thirty-two years ago, Kwadwo Antwi-Mensah was a foreign student struggling to find employment while breaking cultural barriers for acceptance. The African American Christian Foundation (AACF) was born out of a dream. The founder of this organization, Dr. Kwadwo Antwi-Mensah, saw in a dream that he was sitting in a church, the church had a very beautiful choir singing beautifully and the people were dressed in colorful clothes. Ever since, there was an intense desire on the part of Dr. Antwi-Mensah to put a group together to study the Bible and also a singing group so his dream could come true. Acting on his dream, he called a few friends and sent out invitations for people to join him in the study of the Bible. The first meeting was held on January 5, 1985 and attended by a few Ghanaian couples. It was then, the group decided to meet once a month to engage in Bible studies, followed with educational and civic lectures by community and industry leaders. 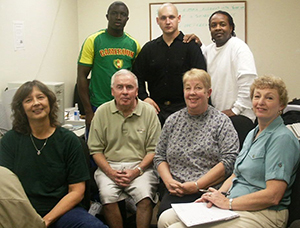 The group grew and move from Dr. Antwi-Mensah’s home to the local park district and later, to an office in Chicago on the corner of Madison and Austin Ave. AACF was incorporated as a non-profit organization in July of 1985. Seeing a need, Dr. Antwi-Mensah began to assist and place in jobs and internships newly immigrated Ghanaians in the Chicago land area, who were extremely educated but could not find jobs due to cultural and language barriers. For the first nine years, the foundation received no public funds, a nd Kwadwo continued to complete his education and do any work he could find to subsidize the work of the foundation. In 1994, with the expertise of Dr. Clifton Woods, AACF received funding to provide job training and placement services to unemployed and low income adults and youth in the Cook County area of the state of Illinois. Loraine Wilson-Grace became the first Program Director and under her leadership, the organization expanded to serve the residents of Cook County. In 2010, AACF began to focus on low income opportunity youths 16 to 24 years of age who were in need of job placement and job training. Finding work is the crux of the AACF’s program offering. Clients get assessed and then take courses in job readiness to qualify for job training in three areas: customer service, digital manufacturing, and certified nursing assistant. Approximately 80 percent of those in the job training program secure job placement and can provide the financial foundation to support, stability, and self-sufficiency. AACF has become a community leader in the workforce development space in Cook County with innovative training offerings for our program participants to succeed in their occupational goals and prosper to the point of being productive individuals in our neighborhoods helping to increase economic development. 2012 Awarded funds by the Chicago-Cook Workforce Partnership to increase our workforce development program capacity and job training services. 1985 Established and incorporated as an Illinois nonprofit organization.